nsettling, eccentric, disturbing are all accurate adjectives to describe Yorgos Lanthimos’ films. The Greek director thrives in the unconventional and is most comfortable when his audience is most uncomfortable. His latest film The Killing of a Sacred Deer will do nothing to alter those descriptions as it may be his most disturbing film to date. Opening with a shot of a beating heart as it is being operated on, Lanthimos quickly establishes the unnerving tone of the film. A tone that he continues to push with the robotic and often overtly blunt nature that his characters speak. A veteran of Lanthimos’ aesthetic, star Colin Farrell delivers his lines in the same stilted manner as his character in The Lobster (the last collaboration between the actor and director) though this time rather than playing a bachelor looking for love, he plays Steven, a respected cardiothoracic surgeon blessed with a gorgeous wife (Nicole Kidman) and two well-mannered kids. The image of a happy nuclear family is uprooted however when both children are inflicted with an undiagnosable illness that leaves both paralyzed – its mysterious appearance seemingly coinciding with the introduction of an unassuming if somewhat peculiar boy named Martin (played by Barry Keoghan of Dunkirk) into their lives. The roles that each one of these characters has to play in the grand scheme of the mystery is one that Lanthimos takes great care in unraveling slowly. 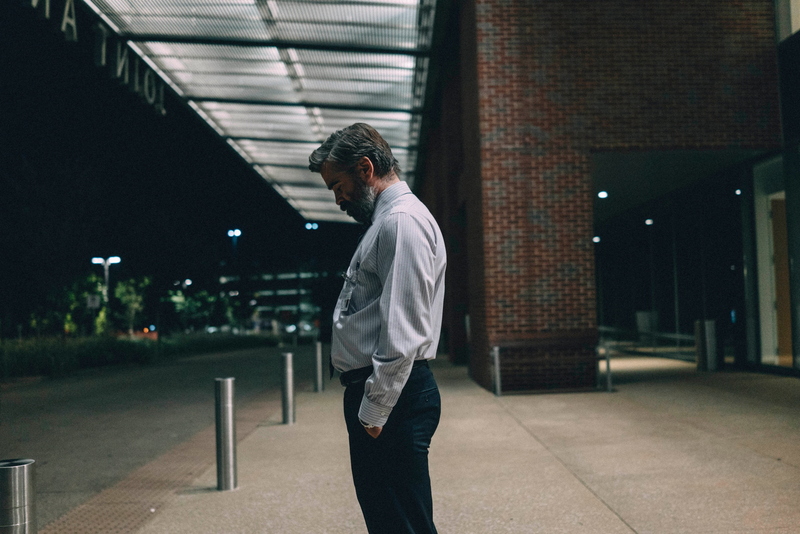 Playing out to a more deliberate pace than his previous efforts in Dogtooth or The Lobster, Sacred Deer is arguably Lanthimos’ most challenging film. Much of the film’s first two acts seem aimless, an exercise in pushing the boundaries of discomfort. He allows the darkness of the film to escalate gradually all while maintaining that overwhelming sense of eeriness established from the opening shot. The score – a product that would fit right in with something like The Shining – adds to this feeling particularly effective in the long tracking shots through the hospital’s sterile hallways and in the many close-ups that Sacred Deer employs. Lanthimos does not bother filling in all the gaps in the narrative, defining his characters beyond the bare minimum. This does not interest him and to some, this approach can be frustrating. Instead, his focus is on crafting a feeling and having that culminate in a devastating finale where his leads have to make an impossible choice. Contrary to the old adage, Sacred Deer is more about the destination than the journey itself. For Lanthimos, the danger lies in having your audience check out before the film reaches its destination dismissing the film as “too weird” or not grasping the unconventional nature of his filmmaking but those who stick with it through the slower first act will be rewarded by Sacred Deer’s strong finish. Invoking elements of Kubrick reminiscent of Eyes Wide Shut (also starring Nicole Kidman) and blending that with a deadpan dark humor that draws comparisons to the Nordic sensibilities of Kaurismaki, not everything lands as effectively as it should but Lanthimos’ vision of a horror thriller is nonetheless clear to see. Aided by his cast who seem to buy into exactly what he wants in realizing that vision, Sacred Deer sees standout performances from both Farrell and Kidman who despite their established status as bonfire stars take interesting risks in this film. Like their collaboration from earlier this year (The Beguiled), the duo of Kidman / Farrell doesn’t exactly convey a natural chemistry but perhaps its more intentional this time around and individually both are strong. Alicia Silverstone makes a brief scene-stealing cameo as well but the big star is Barry Keoghan who manages to outshine his costars in a chilling performance. In viewing a Yorgos Lanthimos film, there comes with a preemptive expectation as to what it will be. The Killing of a Sacred Deer does nothing to shift those expectations; however, he is still going to deliver a unique film in its own way provoking thought and discussion within an audience. That cannot be undersold especially at a time when the box office is dominated by remakes and never-ending franchises. Devoid of the emotional power that anchored The Lobster, Killing of a Sacred Deer hinges directly on the effectiveness of its finale and the protruding darkness that dominates the film from the outset. The result is far from perfect, at times uneven and falls just short of the ambitious heights it strives to reach but is an intriguing thrill ride nonetheless. A Ghost Story is a thought provoking, poignant look at love, loss and the permanence of time. No Pies were harmed in the writing of this review. Our picks for the 40 best movies of 2018. Indie Spotlight: Who’s Watching Oliver? Who's Watching Oliver? fails to capture the indie horror charm of other contemporaries.